Joe Neeper saw the opportunity for creating something new when Walter Ames, one of the firm’s founders recruited him straight out of UCLA School of Law to join Gray Cary Ames & Frye in 1959. He parlayed his interest in antitrust and labor law into establishing the first full-time, management-side labor practice in San Diego— contemporaneously representing, for example, clients such as the City of San Diego, the Port of San Diego, and San Diego County as labor relations adviser. During his 35-year tenure at Gray Cary, Joe Neeper developed more than 20 partners and associates to represent large employers in the San Diego community as well as public entities, arts organizations and several universities. Among his prominent clients were General Dynamics, Solar Turbines, the Copley Press and the Zoological Society of San Diego. “He produced decades of labor peace in San Diego by working collaboratively with both unions and management,” said his law school classmate, partner and friend, Pat Crowell. Joe Neeper also served as general counsel to the University of San Diego, where he was an adjunct labor law professor for more than 20 years. And he mentored a raft of young attorneys along the way. “Joe was truly the Dean of San Diego management-side labor law,” said Rich Paul, now a prominent, San Diego labor lawyer. “He taught us how to be good lawyers, but more than that, he showed us how to be professionals. By his example, Joe combined service to the firm’s clients, service to the community’s institutions and his life-long passion for teaching all into one magnificent career.” In 1982, Joe Neeper became Gray Cary’s first managing partner, a position he held until 1989 when he stepped down to become the firm’s first chair. Respected throughout Southern California, he was nominated to join the City of Los Angeles Employee Relations Board, where he served from 1968 to 1994. After he retired from active practice at Gray Cary in 1995, he accepted Gov. Wilson’s appointment to be a commissioner on the Public Utilities Commission, where he served for almost six years. 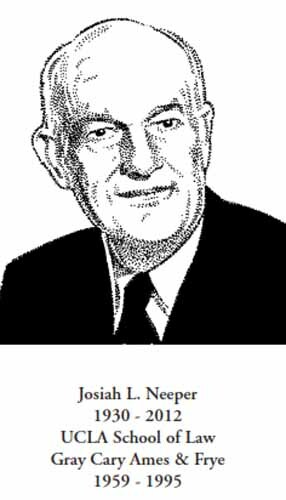 Josiah Light Neeper was born on May 5, 1930 in Philadelphia, the youngest of three children. When his father died, he was sent at age six to Girard College, an orphanage in Philadelphia, where he remained until he graduated from high school and rejoined his mother who had moved to San Diego. Graduating from San Diego State College with a bachelor’s degree in economics, Joe Neeper served two years in the Army in Germany before entering law school at UCLA. Well beyond the legal arena, Joe Neeper contributed to his community, serving as a director or officer for, among other institutions, the Old Globe, San Diego Opera, the San Diego Zoo, Scripps Memorial Hospital and the Timken Museum of Art. In those roles, he put into action his strong conviction that professionals had both the responsibility and the privilege of serving their community and its institutions.